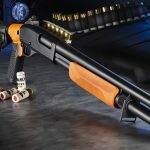 Along with top-tier rifles and handguns, Wilson Combat crafts custom-grade Remington 870s, and now the company is offering models designed specifically for launching less-lethal munitions with orange forends and stock adapters. 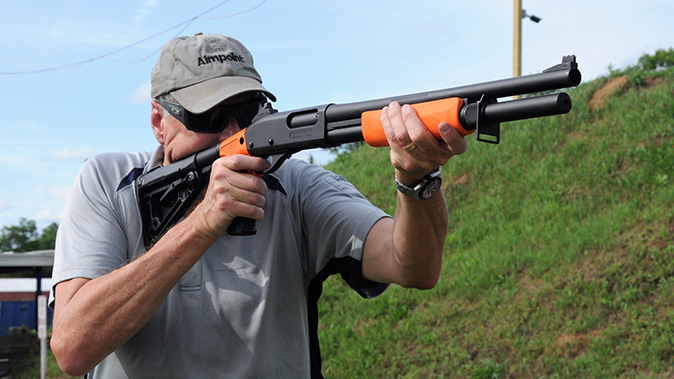 At the range, the Less Lethal 870 was easy to aim thanks to its fiber-optic front sight and Trak-Lock ghost ring rear, and the furniture provided for a comfortable experience. 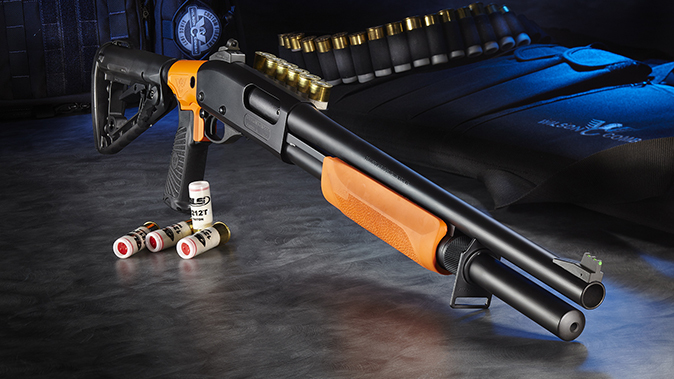 The 870 functioned flawlessly with all of the Defense Technology munitions, including Stinger loads, Fin Stabilized rounds and Drag Stabilized beanbag rounds. 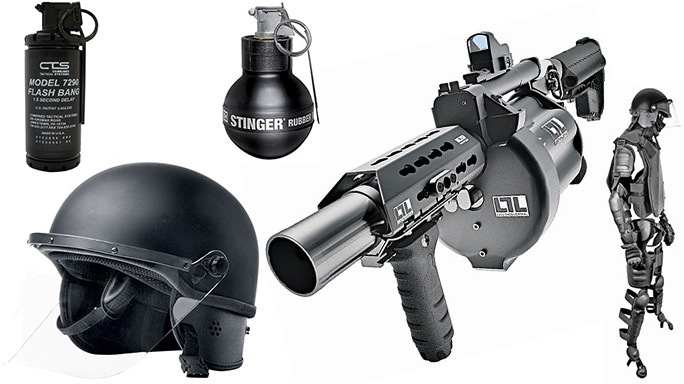 Less-lethal technologies have come a long way over the years, both in launchers and with munitions. 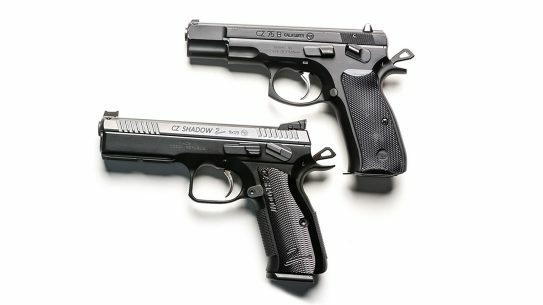 Wilson Combat is known for its premier line of 1911 pistols, along with its 870 shotguns and AR-style rifles. 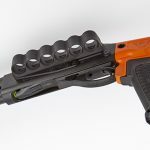 And the company recently introduced a less-lethal 12-gauge launcher that is ready for duty right out of the box. Note that I used the term “launcher,” not “shotgun.” In my agency, we removed all firearms-related terms in our less-lethal program. We launch munitions, not fire them. 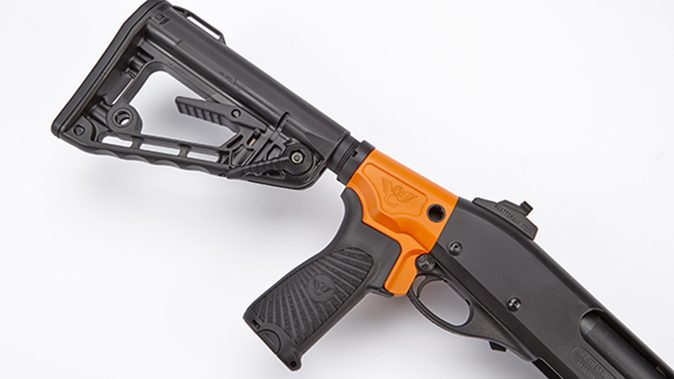 It is a launcher, not a shotgun. This was deliberate, and so far, it has worked well. 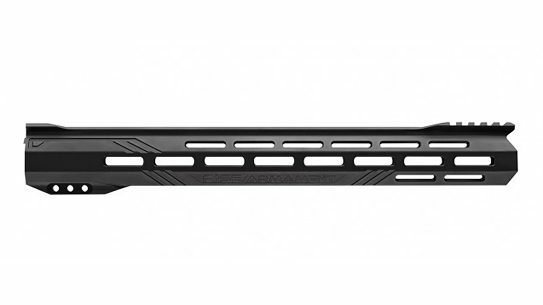 The new Wilson Combat Less Lethal 870 combines all of the features that the company’s scatterguns are known for. 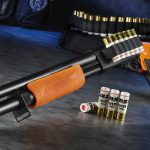 As its name implies, it’s based on a new 12-gauge Remington 870 shotgun, which has been a mainstay of American law enforcement for over 60 years. 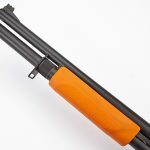 Designed with a steel receiver and dual operating rods, it is almost impossible to wear out one of these shotguns. 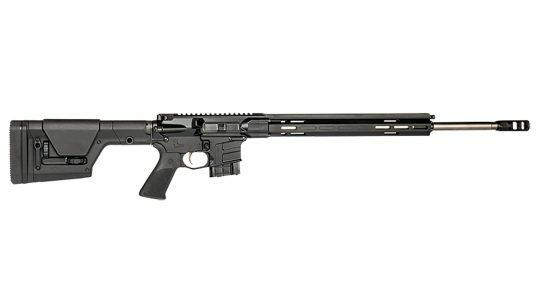 And while my test model featured an 18-inch, cylinder-bore barrel, Wilson also offers a 14-inch-barreled CQB model that is controlled by applicable NFA laws. 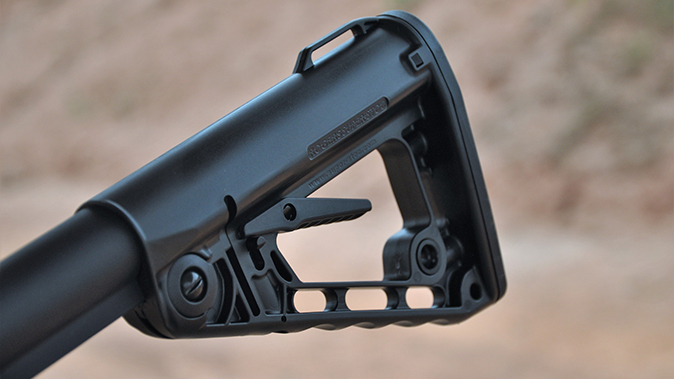 The Less Lethal 870 came equipped with a Mesa Tactical six-round sidesaddle machined from aluminum as well as Wilson’s Trak-Lock ghost ring rear sight, a very robust design that is adjustable for elevation. 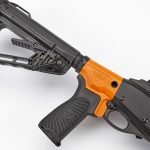 This is paired with a high-profile front sight with a green fiber-optic insert that allows for rapid target acquisitions and follow-up shots. 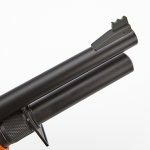 A Wilson two-shot extended magazine tube increases the capacity of the 870 and includes a powerful, non-binding spring for reliability and a high-visibility green follower. 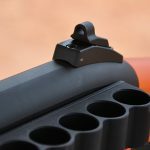 This new follower improves feeding and provides a highly visible indicator when the magazine is empty. 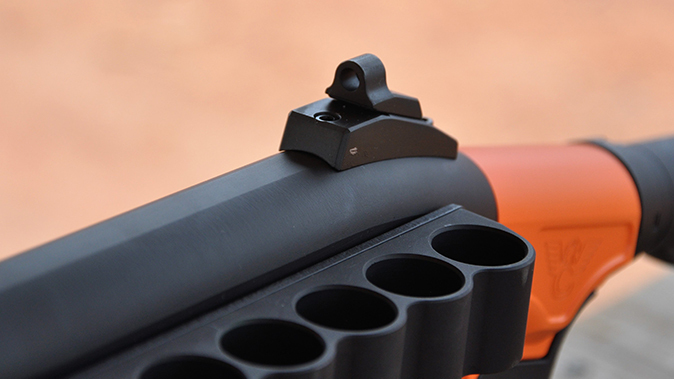 The extended magazine tube also has a mounting plate for a sling. It’s also critical that a less-lethal weapon be identifiable as such. There should never be any confusion, and lethal ammunition should never be loaded or accessible to a less-lethal weapon. 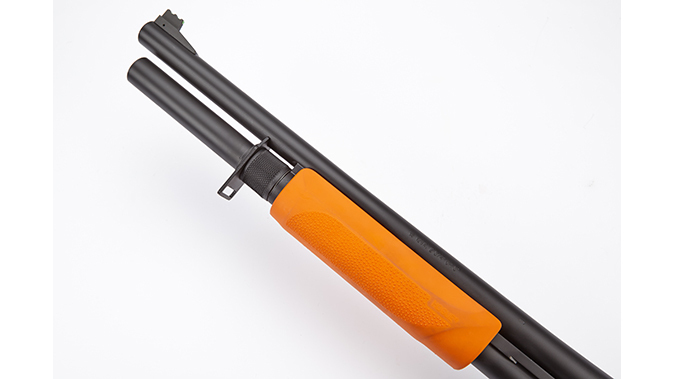 In recent years, this had been accomplished by making the stock and forend a different color. 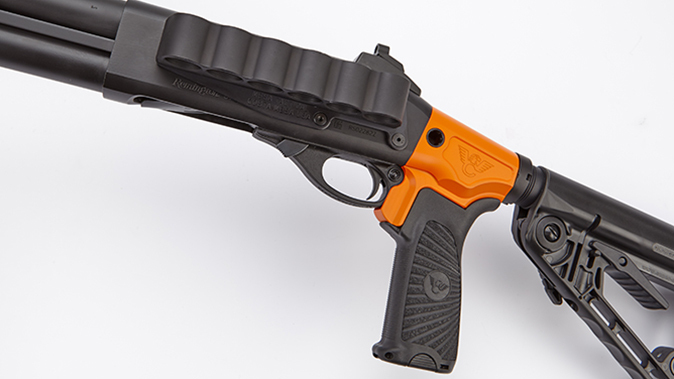 The Wilson Less Lethal 870 is available with either a traditional stock or a collapsible Rogers Super-Stoc. 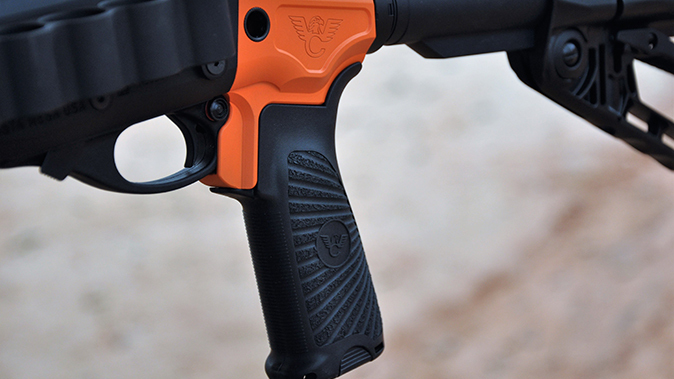 My test gun came with the latter as well as a Bravo Company Starburst Gunfighter grip. 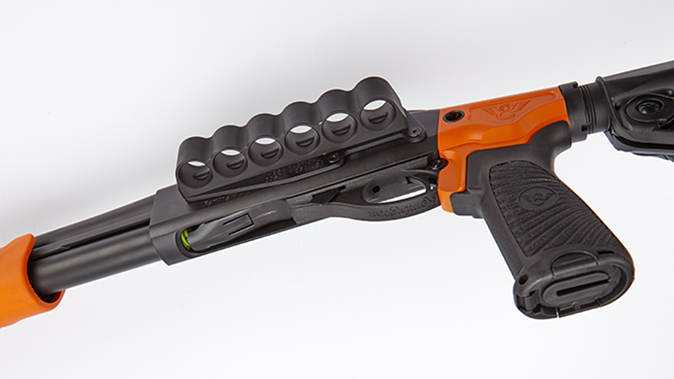 The mounting adapter is bright orange, as is the Hogue rubber-overmolded forend. An oversized safety is also included. Internally, Wilson slicks up the bearing surfaces to smooth the action and does a trigger job. 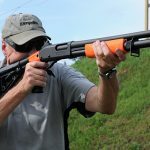 To fully evaluate the Wilson Less Lethal 870, I reached out to Defense Technology, a subsidiary of Safariland that has been a leader in less-lethal and non-lethal munitions for over 30 years. 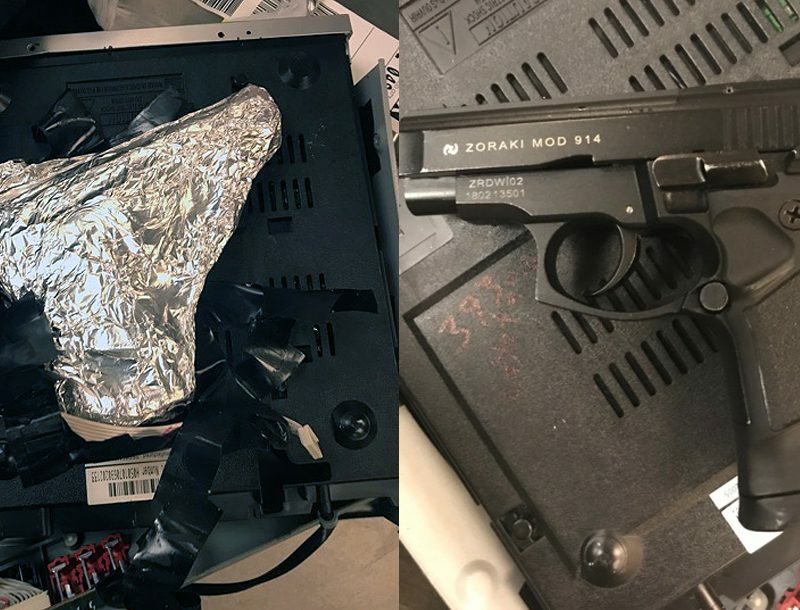 The company provided me with a few less-lethal loads as well as a warning/signaling load. It should be noted that anyone using any of these munitions should first seek authorized training and be certified in their use. 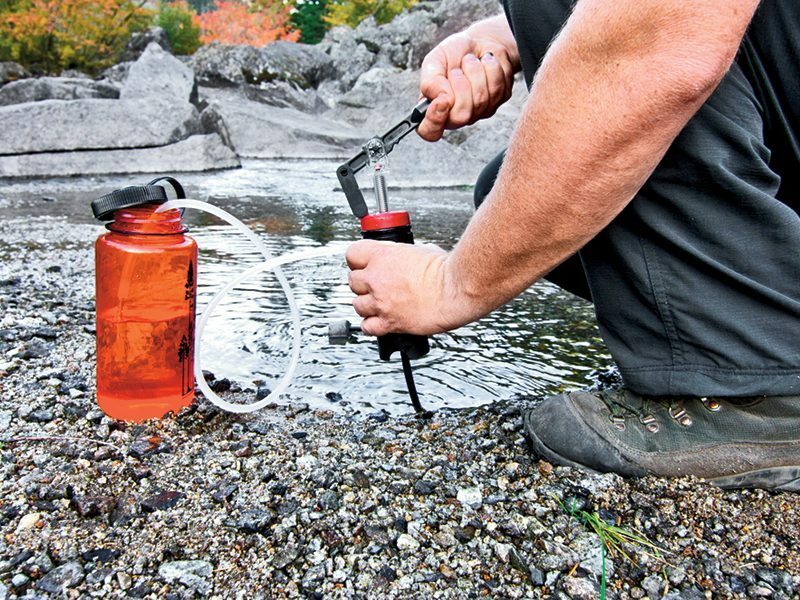 This is critical in understanding the intended purpose and proper deployment of these products. 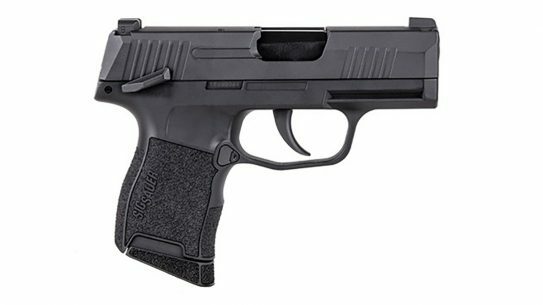 The first load, and perhaps one of the most used in law enforcement, is the Drag Stabilized round. Commonly called a beanbag round, this is a tear-shaped bag constructed of cotton and ballistic material. The bag is filled with #9 shot and has a weight of 1.43 ounces. The design of the bag incorporates four tails that stabilize the round for improved accuracy and sustained energy over longer ranges. The round is made for incapacitation and distraction to gain compliance. 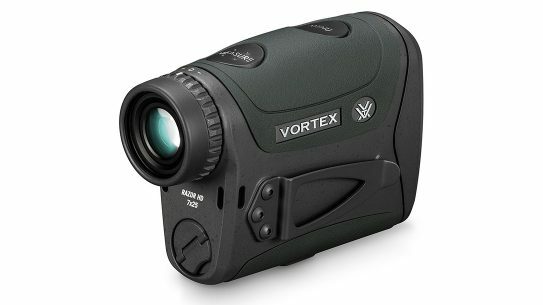 The data sheet specifies a velocity of 270 fps. 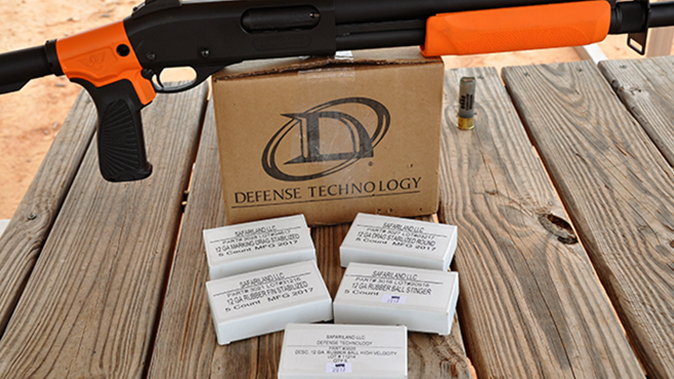 Due to the energy of this round, Defense Technology advises that the minimum safe range for use is 20 feet and the maximum effective range is 75 feet. 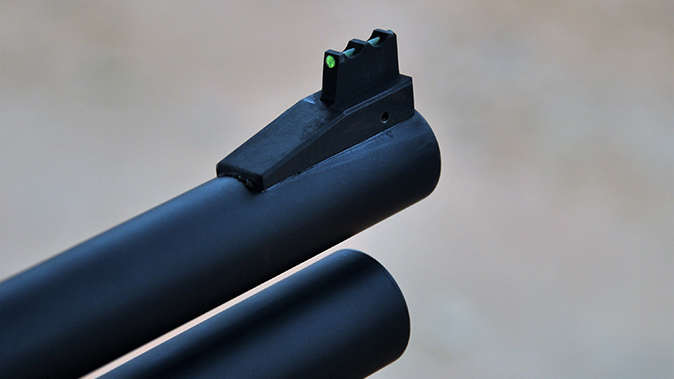 This round comes in a standard configuration or as a marking round that contains a green marking powder. On the range, the Drag Stabilized round chronographed at 298 fps. 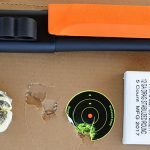 For accuracy testing, I set up a standard USPSA cardboard target at 20 yards. At that distance, the Drag Stabilized round left a significant indention in the cardboard but did not penetrate the target. I fired the group from a standing position and found the ghost ring sights were a significant advantage in accuracy. Aiming at a 3-inch Shoot-N-C bullseye, the Drag Stabilized round produced a 3.5-inch group with two rounds touching and one flyer. The difference between the point of aim and point of impact was also approximately 3 inches. 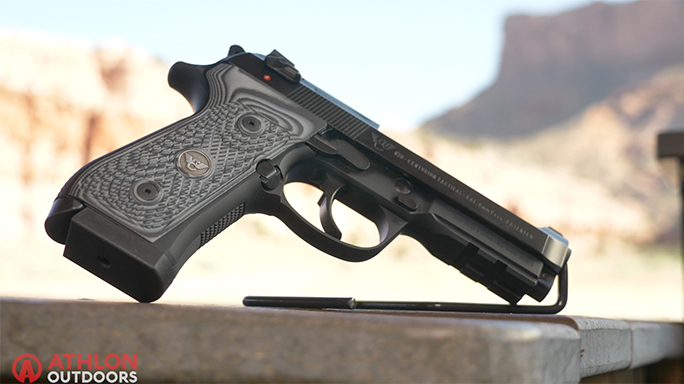 On the range, the standard-velocity Stinger load chronographed at 466 fps. I initially tested this load at 45 feet, which is beyond the recommended maximum effect range. However, in a crowd control or correctional environment, this is not an unreasonable distance. I also wanted to observe how the load patterned out of the Wilson Less Lethal 870. 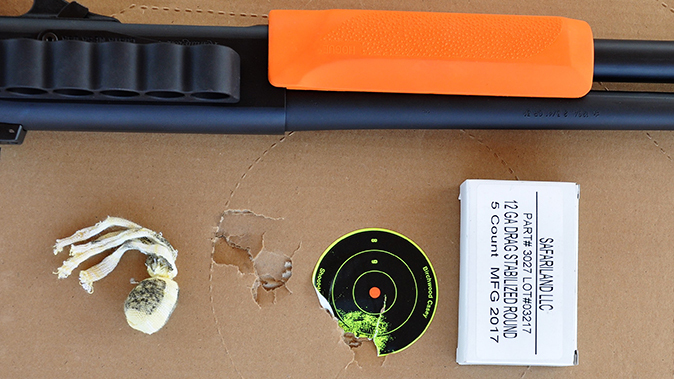 Again, using a USPSA target, I fired three rounds for a total of 54 pellets. At this extended range, 28 pellets, or 51 percent, struck the target. I then moved to 15 feet, the minimum safe range of the load. At that range, all of the pellets clustered into a tight group that measured approximately 4 inches in diameter. The high-powered version chronographed at 1,048 fps. 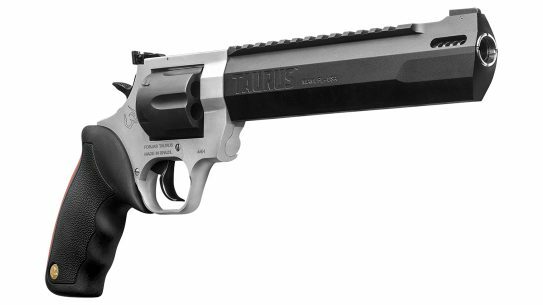 At 45 feet, it averaged 12 hits per round. I was on a dirt range and using a target stand, so I wasn’t able to skip-fire any of the Stinger loads into a target. However, in previous training, I found this to be a very effective and useful technique. 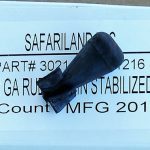 I also tested the Fin Stabilized round. 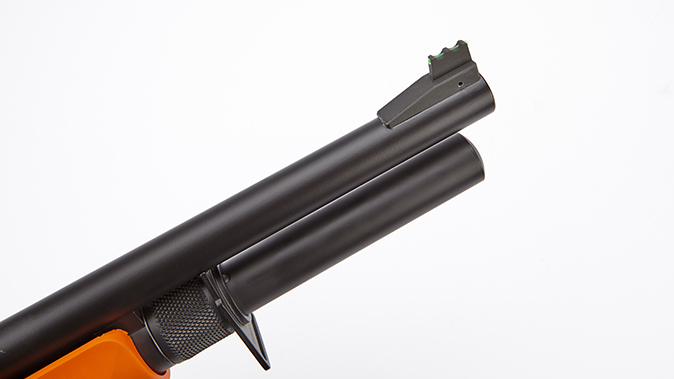 This round consists of a single rubber round that incorporates fins to improve accuracy. 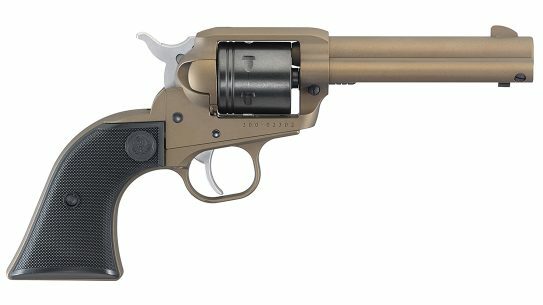 The round weighs 62.2 grains and chronographed at a mild 435 fps. This round is used against a single subject to gain compliance through “medium-pain compliance.” According to the data sheet, “it is most suitable at close to moderate ranges, approximately 15 to 35 feet. 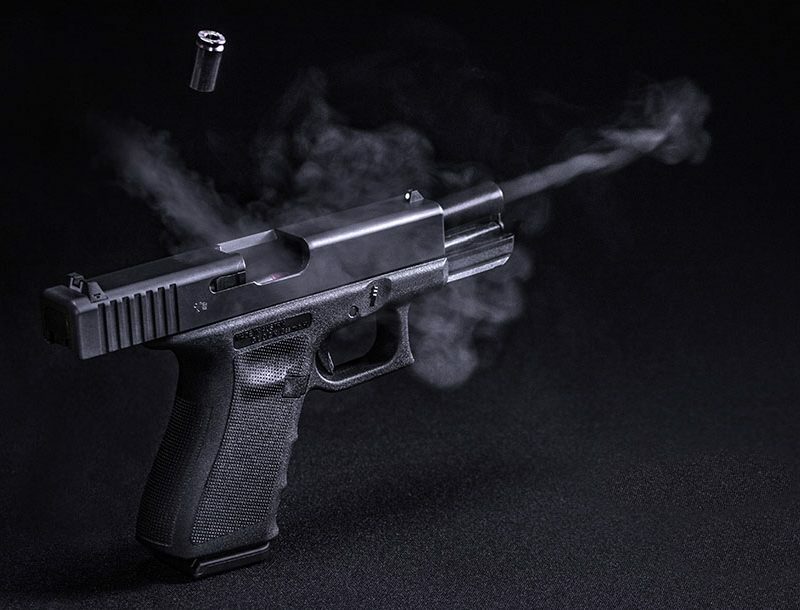 It is not suited as a dynamic, high-energy, single-subject round for the purposes of incapacitation.” While the recommended maximum effective range is 35 feet, I wanted to see what kind of hits I could get on target at an extended range. 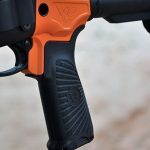 At 60 feet, I was able to put three solid, center-mass hits on a USPSA target, with two of the rounds striking within 2 inches of the point of aim. The third round was a flyer that went high on the target. Interestingly, even at that range, the round penetrated the cardboard target. The final round I tested was a warning/signaling load. This load is designed to produce 170 decibels of sound and 2.2 million candelas of light over the intended target. These rounds can be used in maritime environments, at vehicle checkpoints and other situations to gain the attention of a subject, vehicle or boat. 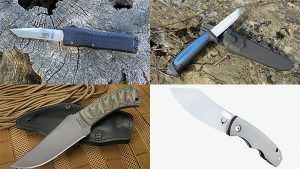 They can also be used as a distraction and intimidation device in an outdoor environment. It is important to note that this munition is not intended for indoor use and should not be fired directly at a person. 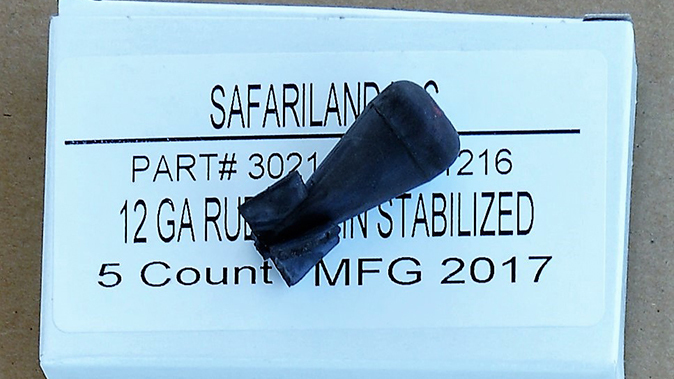 The warning/signaling munition is available in 50- and 100-yard loads. Each is designed to be fired at a 5-degree elevation angle. When this tactic is utilized, the round will travel the respected distance and “deflagrate” at approximately 20 feet above the target. I tested the rounds on a rifle range that was set up with ranging stakes. Both loads deflagrated within a few yards of the applicable stake. I can also tell you that the 170-decibel report gained the attention of everyone on or near the range. 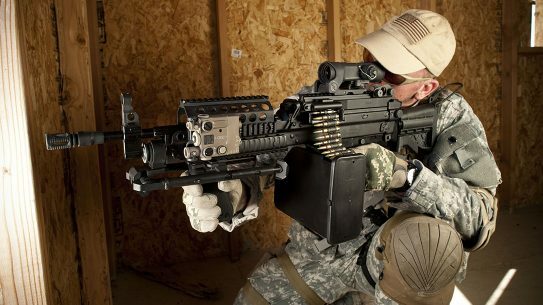 The visible flash during a nighttime deployment would be a real attention-getter. 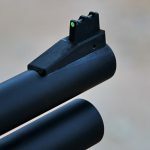 These rounds could be utilized in areas where it would be unsafe to deploy a traditional flashbang, and they aren’t controlled by the BATFE like flashbangs. Defense Technology also produces a Ferret round that can penetrate barriers and introduce a chemical agent into the area. This round looks similar to the Fin Stabilized round but is filled with a chemical agent. These rounds can penetrate windows, hollow-core doors and other similar barriers and deliver either liquid or powder OC or CS. 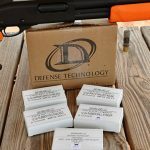 According to Defense Technology, the muzzle velocity of these rounds is 1,000 fps, and they have an effective range of 50 to 100 yards. This load is perfect for confined spaces and does not generate any heat or produce a fire hazard. I have to admit that testing these rounds was a lot of fun, and I would see a valid application of some of the products for animal control officers and the civilian market. 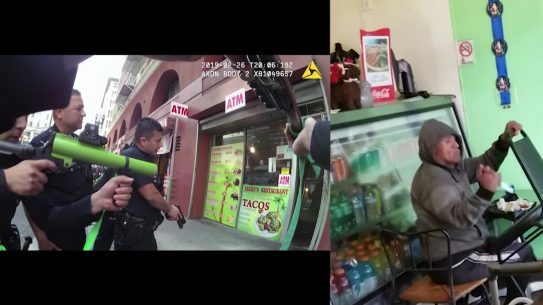 Today, liability concerns and public perception are increasingly making the job of law enforcement more difficult. 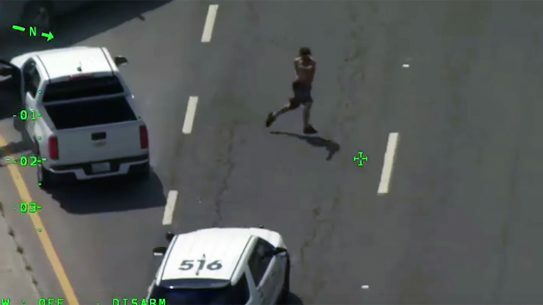 While the safety of the public, and the officers, will always be a priority, the appropriate application of less-lethal munitions offers one more option. 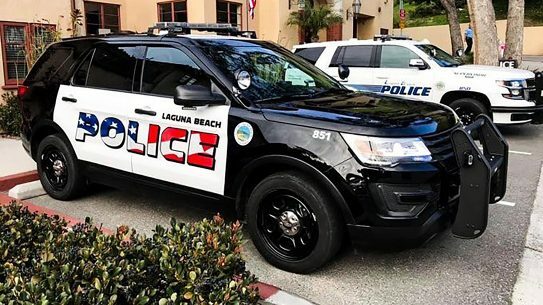 It should be noted that standard protocol and training requires that when a subject has a weapon or presents an immediate danger to the officers or the public, less-lethal munitions should not be deployed without a cover officer providing a lethal-force option. 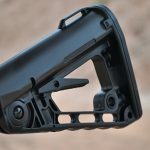 I would like to thank the great folks at Defense Technology for assisting in this article. These products are not readily available and their assistance was invaluable. 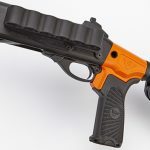 As more agencies consider less-lethal options, the Wilson Combat Less Lethal 870 provides a complete ready-to-field platform that is reliable, functional and easily identifiable. 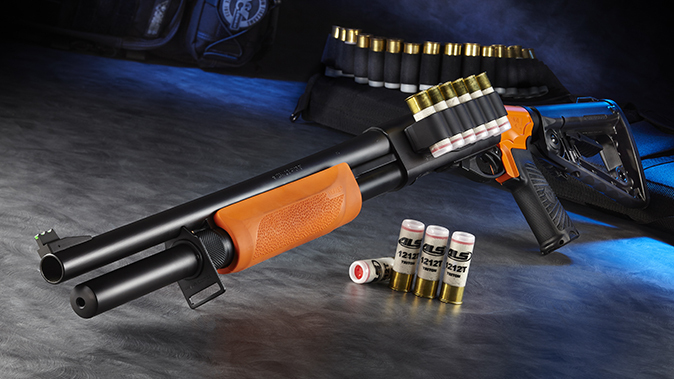 In addition, this upgraded Less Lethal 870 is packed with quality components and backed by Wilson Combat’s customer service. 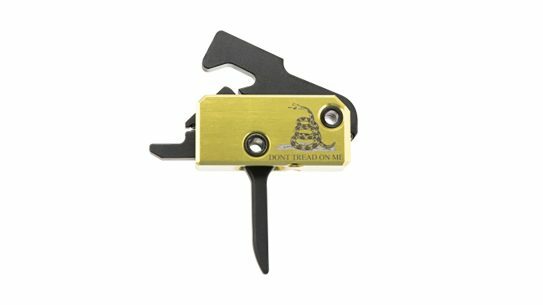 For more information, visit wilsoncombat.com and safariland.com.